policing, whether it be a free cup of coffee, free meal from a fast food restaurant, or discounted merchandize from a local merchant. Receiving any form of compensation or gift from citizens or the business community, no matter how harmless the gesture, needs discussion. In a study by Prenzler, Beckley, and Bronitt (2013), the researchers noted a survey of U.S. law enforcement officers that 59% agreed that it was appropriate for a police officer to accept free coffee or a meal while on duty. Australian police responded to the same survey with 66% agreeing that that it was acceptable (Prenzler, Beckley, & Bronitt, 2013). 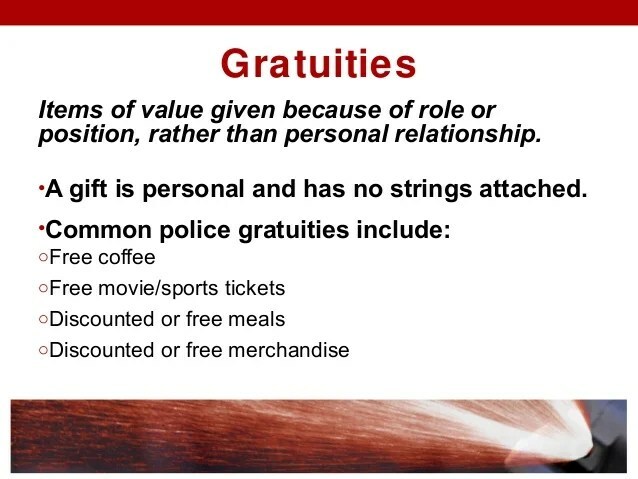 These surveys suggest that police culture is accepting of gratuities as normal practice. Prenzler, Beckley, and Bronitt (2013) argue that law enforcement needs to adopt a highly restrictive policy on gratuities and that police supervisors must enforce compliance so that public trust is not undermined. I understand this argument, but the reality of such a zero-tolerance policy is unrealistic given the nature of police relationships with the community. Del Pozo (2005) said “small gratuities are tokens of civic friendship that are seen as vital to forming the bonds that community policing requires” (p. 42). Del Pozo (2005) further states, “I would rather assume that such small tokens are given and taken for all the right reasons” (p. 43). My position is one of common sense on police gratuities from my law enforcement experience. Offer to pay for your food or drink, but if the business employee refuses, just leave the money as a tip. This way it is a win-win for everyone, you did not offend the business establishment for refusing their generosity and you did not violate the department ethical code or general orders because you left the money to pay for the drink or food in a show of respect and good faith. I personally never felt comfortable accepting anything free while in uniform, perhaps because I also thought there was strings attached and it was assumed favors are now owed by me in the future. This was just my way of handling the issue of gratuities while on the job. It worked for me, but it did cause several colorful debates among the officers I was with when I left the tip when the manager declared the meal was on the house. Some law enforcement agencies have a complete ban and general order prohibiting officers from accepting any type of gratuities, even free coffee. Enforcing this policy is almost impossible because of the nature of police work. Other agencies have trained their officers on possible pitfalls of gratuities and leaving the discretion to officers on accepting small gratuities. Each agency has to determine the best gratuity policy that will work for their officers and community. Police gratuities can be an ethical slippery slope. Does accepting small gratuities lead to police corruption? Del Pozo, B. (2005). One dogma of police ethics: Gratuities and the democratic ethos of policing. Criminal Justice Ethics, 24(2), 25-46. Posted in Mark's Articles and tagged Criminal Justice, Criminology, Ethics, Leadership, Police gratuities. Bookmark the permalink. When I was hired in 1990, Chief William McCormack of the Metropolitan Toronto Police Force had said, “Corruption starts with the first free cup of coffee.” That philosophy always stayed with me. A generous tip, paying for the next person in line or insisting on payment were always great ways to stay on top of the perception.